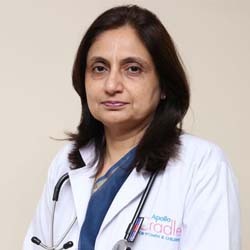 Dr Seema Theraja is a senior consultant in obstetrics and gynecologist and has been into private practice for more than 25 years. MBBS – Lady Hardinge Medical College – New Delhi – 1986. MD – Obstetrics and Gynecology – Lady Hardinge Medical College – New Delhi – 1991. Senior Residency – Obstetrics and Gynecology – Lady Hardinge Medical College – New Delhi – 1992-1994. Laparoscopic Training from World Laparoscopic Centre – 1998. Worked as a senior consultant, previously in west Delhi Hospitals like Action Balaji, Mata Chanan Devi Hospital and MGS Hospital. Antenatal Check-up and high risk pregnancy clinics, with vast experience of 25 years. She is an expert to deal with all High Risk Pregnancy cases, their related treatment and complications. Deliveries and Caesarian Section:- In 25 years, she has conducted 1000’s of normal deliveries and complicated normal deliveries, caesarian section and their associated complications. Gynecology Operations/Surgeries – Conducted various Gynecology surgeries like Hysterectomy (vaginal and abdominal). She is adapt in conducting all standard Gynecology operations for prolapse, Fibroids, Ovarian Cysts etc. Clinics of Menopause and Adolescent:- Adolescent Endocrinology related problems. Infertility treatment – Basic infertility work-up, IUI, Ovulation Induction, Laparoscopic Work for infertility patients. Dr Seema Theraja has attended various national and international conferences, workshops, and hands on workshops. My baby and I really are lucky to be at Apollo Cradle for the maternity care. Special thanks to Dr. Seema Theraja for delivering the timely care. She comforted me with all her positive words and encouraged me when I was down or low. I also loved the ambience and interiors of Apollo Cradle facility. Thank you for the wonderful experience, Apollo Cradle. I am so glad that a new journey in our life started with such a wonderful welcome and stay from you. Special thanks to my doctors, nurses and all the support staff who take such good care of the patients. I\’m very happy with the hospitality and warmth given by every one here at Apollo Cradle. Our doctor, Seema Thareja was very supportive and made me feel comfortable and at ease. Thank you to everyone at Cradle. I would like to thank the entire team of doctors, sisters & the team @ Apollo Cradle. Services delivered are beyond expectations, and services like photoshoot, cake-cutting, candle light dinner, are like the icing on the cake. My entire family has cherished the welcome of our new-born, and a very special thanks to Dr. Seema Thareja for recommending us to this hospital. I promise that we shall recommend Apollo Cradle to all our friends. With a name like Apollo Cradle, you have high expectations. And I was delighted to experience that they exceed them! Excellent service and good ambience. Our doctor, Seema Thareja too was very good. Thank you all. Apollo Cradle made me feel at home and comfortable with their excellent hospitality and care. I would like to thank everyone in the Apollo team for all the good work they have done. Its the small things that make a big difference, so a special thank you for the lovely surprises like cakes, car drops and photo sessions. I loved and enjoyed them all! Thank you all once again and all the best. I would like to thank the entire team of doctors, nurses & the support staff at Apollo Cradle. The services were beyond my expectations, especially the photoshoots, cakes, candle light dinners, etc. They were such wonderful suprises, they really were the icing on the cake. My family too was delighted at the hospital’s services and I’m very thankful to Dr. Seema Thereja for recommending this hospital. I’m certainly recommending Apollo Cradle to all our friends.